Natural thyroid remedies can help treat the condition which causes the thyroid to become underactive. This gland is located at the base of the neck and can become enlarged when underactive. Al lack of throid hormone can cause body functions to generally slow down. From 1-4 of all adults have hypothroidism and up to 10% have an underactive gland. Many autoimmune conditions suchs as rheumatoid arthritis, lupus, Sjogren's, and multiple sclerosis are associated with an autoimmune form of hypothroidism known as Hashimoto's throiditis. When this happens, the body's antibodies attack the thyroid causing acute inflammation and a short term (a few weeks) course of HYPERthyroidism before the thyroid basically burns itself out. The person then becomes hypothryoid. Diabetes is also associated with disorders of this gland as during the course of diabetes, many other body systems are affected and start to malfunction. Black cohash Tablets. Take as directed on label. Helps calm hormonal symptoms. Kelp (seaweed) Use as directed on label. 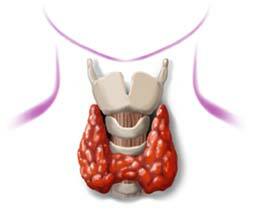 Contains iodine, needed for thyroid health. Guggul Tablets.25mg 3x/day. Lowers cholesterol and triglyceride levels. Tips: Avoid consuming large amounts of soy foods, such as tofu or miso. They contain a chemical that interfers with the body's use of thyroid hormone. If taking prescription thryroxine, try also using dessicated thyroid tablets. These tablets have all the gland's hormones except thyroixine, however they CANNOT be used in place of the prescription medication. Get more information about herbal therapies with dessicated thryroixine. Temporary use of steroids (a month or so) can produce symptoms similary to low thyroid. These will reverse within a week or two of discontinuing the steroids. Lithium, used to treat bipolar disorder, can also cause malfunction of the thyroid in some cases. Untreated conditions with this gland can lead to increased LDL levels (low density liproprotein) which can increase the rate which cholesterol can cause plaques in arteries. Guggul therapy can help with this but you should not take Guggul if taking certain medications for high blood pressure such as calcium channel blockers (Verapamil, Cardizem) or beta blockers (Inderal, metoprolol). Should you avoid thyroid herbs? Read more about natural thyroid remedies to avoid. Subscribe to Herbal Hints our monthly ezine. You will receive free tips on how to use different herbs, new recipes and learn about the "Herb Of The Month". I promise to use it only to send you Herbal Hints. Sign up for the Herbal Remedies Information RSS feed..it's free!